It is now well established that Ice Ages did exist and that the last Ice Age ended approximately 12,000 years ago. 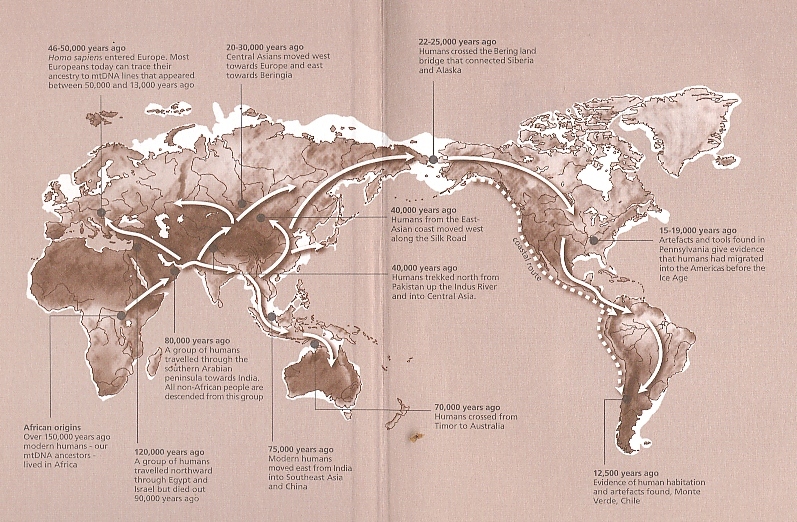 We also know that the Asian Continent was at that time populated by nomadic peoples, Hunters and Gathers. The Ice Age greatly changed the climate of Asia with the Northern Ice Cap extending as far south as latitude 50 deg. North. Most of Europe was covered with a thick layer of ice, in some parts up to 2,000 mtrs thick. 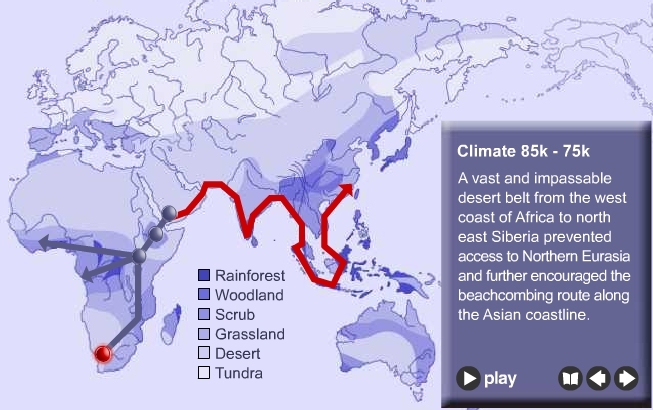 It is safe to assume that this climatic change would have forced the Nomadic Peoples of Asia to migrate south into what is now called the Tropical Zone. As nomads they did not have permanent dwelling and they would have had to follow the game south anyway. As the icecaps developed the water level in the world oceans receded until at the height of the ice age it was approximately 150 mtrs. below present day levels. Due to this lowering of sea levels the South China and Java Seas became dry land exposing vast flat, fertile plains to the south - bound migrants. If we study the topographical map of the worlds oceans we see that the Sunda Shelf was at that time the best piece of real estate on the planet. Situated directly over the equator with mild temperatures due to global cooling, it would have had two summer seasons every year. 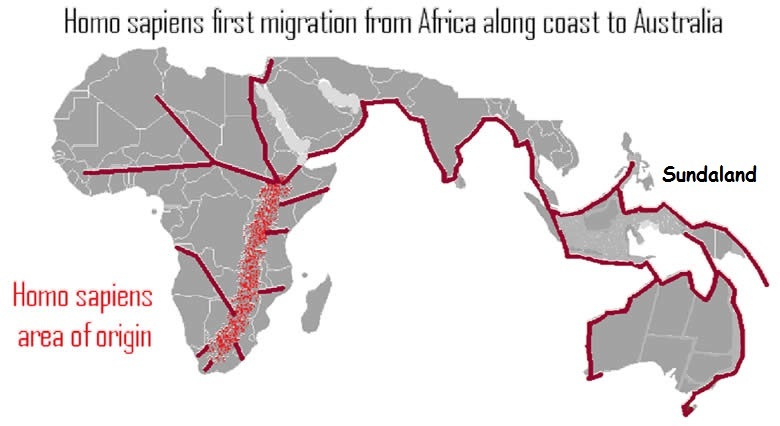 When we look at the shape of the Asian continent in relation to the new Sub-continent formed by the drying of the Sunda Shelf we see a funnel, funneling the migrants into an area much smaller than the area that they had previously occupied. I argue that an unprecedented concentration of population occurred on the Sunda Shelf at that time and that this triggered the development of the planets first civilization. The nomadic lifestyle of the hunters and gatherers requires a vast amount of land. As an example the entire Continent of Australia supported only three million Aborigines after 40,000 years of occupation. When the migrants from the north streamed onto the Sunda Shelf they had two choices, either fight each other for space or develop a new lifestyle. At first they would have fought each other but because of the relative lack of space there was little room to maneuver. They tended to bump into other hostile tribes. The only solution was to take up a position and defend it. With the primitive weapons of that time the advantage was with the defender. Depending on the sophistication of the defenses one person defending was equal to three on the attack. And so the nomadic lifestyle came to an end for the majority of the tribes competing for space on the Sunda Shelf. Now that the tribe could no longer go to the food, the food had to be bought to the tribe. At first hunting parties would have herded game close to the defensive position and killed it there. The next step would have been to drive game into the defensive position itself so that a store of food was available and the animals killed when they were required. From there it was a relative short step to tame the captured animals and eventually graze them under supervision. 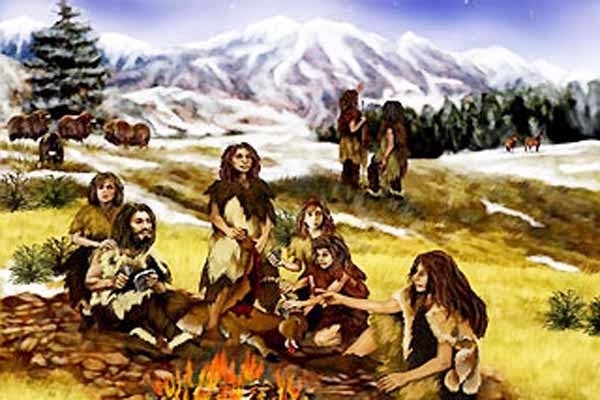 Now for the first time humans had a steady surplus of food available to them. Parallel to the development of animal husbandry, farming would have developed for the same reasons. Once this was achieved the population would have increased dramatically. Mankind was now firmly on the path toward civilization. How sophisticated did this Sunda Shelf civilization become? We don’t know the answer to this question because the Sunda Shelf is now covered by 60 meters of water and twelve thousand monsoons have deposited a layer of silt over anything that may have been there. After more than 60 thousand years of Ice Age the great melt began in approximately ten thousand BC. By all accounts the melt was rapid. In fact the Melt was a catastrophic event that nearly wiped mankind off the face of the earth. There are some 500 Flood Myths from around the world that refer to this event. The Noah tale from the Bible being only one of them. In this tale the sea rose to the height of the mountains. Of course this is impossible as there is only X amount of water on the Planet and that is either water in the sea or ice at the Poles. However Tsunamis can if they are big enough and when we look at the magnitude of the catastrophe then we sense that Tsunamis may well have been involved. These Flood myths may well be eye witness accounts of a catastrophic event and it would not be good science to dismiss them entirely in light of what we now know about this period and in light of the sheer number of these myths. Why the melt was so rapid we don’t know with certainty, there are however several theories that try to explain the phenomena. One theory says that when the Ice Cap was advancing south across the Eurasian and North American Continents it pushed up a wall of earth and debris ahead of it. Which once the melt started acted like a dam wall containing the melt water in huge lakes (Steve Oppenheimer- 'Eden in the East'). Then when the waters breasted the wall it caused the wall to collapse. Trillions of cubic meters of melt water cascaded into the sea causing a rapid rise in sea levels. The problem with this theory is that it does not explain the massive extinctions that took place during this period. Up to sixty percent of all mammal species became extinct and two human races vanished form the earth. Also it does not answer the question of what caused the rapid melt. An other theory says that a large asteroids hit the earth off the East Coast of North America. The crater fields of Carolina mark it’s path overhead. (Otto Muck- "Secrets of Atlantis"). When it hit the water it sent a six hundred meter high tsunami across the Atlantic to crash with devastating effect into the coast of Africa and Europe. The earth received such a blow that it began to wobble on it’s axis. A remnant of this wobble is still present today. The Shock wave from this impact opened up the Mid Atlantic Rift and hundreds of under water volcanoes erupted. These eruptions sent thousands of tons of steam and ash into the atmosphere causing world wide flooding. It may well have rained for 40 days and 40 nights. Also the Atlantic would have heated up rapidly. An other theory is that the Southern Ice Cap had become so unstable that it collapsed plunging country sized pieces of the Southern Ice Cap into the ocean creating giant tsunamis as well as an instant rise in sea levels in the order of 50 to 70m. One hundred and fifty meters of the worlds oceans had been deposited as ice at the poles so they must have been huge. The ice at the south pole would have grown to a massive slab perched somewhat precariously on the relatively small continent of Antarctica and extending far out into the deep ocean surrounding Antarctica. We have evidence that the Northern Ice Cap took an other 2000 years to melt and this does make sense because it was much more stable than the Southern Ice Cap. The North Pole does sit over water but is surrounded by land masses so that the bigger the Northern Ice Cap became the more stable it became. There is scientific evidence that suggests there were 3 great floods at the end of the Ice Age not just one. There was one large flood followed by two smaller ones proximately 1000 years apart. This is consistent with theory one and the melt water lakes. There is one more theory, that of Crustal Displacement ( Hapgood ). This theory states that when the Ice Caps reach a certain mass as they did at the end of the last Ice Age they can cause the earths crust to slip. The earths crust is very thin compared to the earths diameter. The impact of an asteroid coming in at a low angel or even the extra gravitational pull during a line up of the major planets could be the trigger for such an event if the icecaps have reached critical mass. Sounds too incredible but there are some facts that support this theory. )ne is the wooly mammoths snap frozen in the Siberian Permafrost Zone. These beasts still have the green grass in their mouths. What ever caused them to be snap frozen must have been sudden. If it was a local event then they would have thawed out once the event finished. What complicates the understanding of this event is that it happened at the end of the Ice Age. A rapid melt was taking place at the very moment these animals were being snap frozen. The only explanation that makes sense is that their region was suddenly catapulted north wards into the Permafrost Zone. The change in Latitude would be in the order of 30 degrees so that Siberia was previously where Kazakhstan is now. Factoring in the lower temperature experienced during the Ice Age it all makes sense. These animals were grazing in a cold but habitable Central Asian region, they were wooly after all. Then their region was thrust northwards some 30 degrees of latitude. Massive earthquakes and other traumatic events plus a large drop in temperatures would have killed them off. But because they were now within the Arctic Circle and the Permafrost Zone their bodies remain frozen to this day. Then there is the issue of the fossilized forests on Antarctica. This continent sits directly on the South Pole. This means that Antarctica experiences 6 months of darkness each year. Trees cannot grow in such a place. Up to now the phenomenon of trees growing on Antarctica has been explained in terms of Plate Tectonics. But movement due to Plate Tectonics is a very slow process something like 20 kilometer, in a million years. We may yet find fresher forests under the ice in Antarctica. 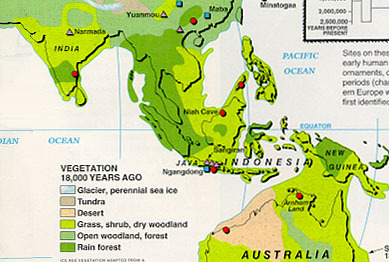 The Ice Age was probably triggered by the mega eruption of a volcano on Sumatra 70,000 years ago. Lake Toba is the crater left over from that explosive eruption. Ash from that explosion was flung high up into the atmosphere and circled the globe. The ash deflected the suns rays resulting in a cooling of the Earth. Global temperatures fell approximately 10 deg. and the covering of ice and snow kept the temperature down after the ash had settled. Gradually the Ice Caps increased and sea levels dropped. Then 12000 years ago an Asteroid struck the Atlantic Ocean off the coast of North America generating a giant tsunami and causing the earths crust to slip. Massive earthquakes wracked the planet opening up the Mid Atlantic Rift. Underwater volcanoes erupted sending steam and ash into the atmosphere. As much as terrestrial volcanoes cause global cooling underwater volcanoes cause global warming. The Southern Ice Cap broke up due to the impact shock wave and earthquakes generated by the slippage of the earths crust. Large pieces of the Ice Cap settled deeper into the Southern ocean resulting in an instantaneous rise in sea levels and more giant tsunamis. Meanwhile the steam and ash turned into torrential red and black rain which went on until the volcanoes settled down. Temperatures on earth climbed rapidly due to the steam driven rain and the warming of the Atlantic Ocean. Because the ash was mixed with steam there was no ash induced cooling as the ash washed back down with the rain. Even the ash from the terrestrial volcanoes would have been washed back into the sea because with so many eruptions there would have been no explosive high altitude eruptions. The warming kick started the North Atlantic Conveyer or Gulf Stream pumping warm water onto the European Coast resulting in a rapid melting of the Northern ice cap there. As the Northern Ice Cap melted it left behind it 2 large melt water lakes one over North America and one over Eurasia. The larger Eurasian lake was the first to be breached resulting in a 30 meter rise in sea levels then the North American lake resulting in a further 20 meter rise in sea. The rest of the ice mass then melted slowly a process that is still continuing today.